Even as major projects are planned or underway at Yanbu Industrial City, a strong campaign is underway to draw more foreign investors to the city, one of two powerhouses in Saudi Arabia, the other being its counterpartin Jubail. Dr Alaa Nassif, the chief executive of the Royal Commission at Yanbu, led a team at a roundtable in Houston, Texas, US, recently, to share information and communicate prospects for business in the Red Sea hub to a group of US companies. Yanbu has developed mainly as a refining and petrochemical hub over the past 40 years but it wants to diversify into other sectors in a more significant way. Yanbu is targeting such industries as chemicals and plastics, packaging, desalination, energy, motor vehicles, fabricated metals, specialised glass and logistics. Royal Commission officials apprised the Americans about infrastructure support, financial incentives, the availability of key feedstocks, and markets. The Houston roundtable was organised by the US-Saudi Arabian Business Council (USSABC). “Yanbu’s competitive package of land, utility and infrastructure services coupled with its access to Middle Eastern, European, Asian and African markets makes it a must for consideration for any international firm looking to expand its footprint in the region,” its CEO Edward Burton stated. Dr Nassif has said investments at Yanbu Industrial City were $40 billion in petrochemicals, refining and desalination and expectations were that another $21 billion would come in by 2020 for new hydrocarbon downstream projects including autoparts and for a minerals hub. A shipbuilding yard is also in the planning stage. The city now hosts around 33 hydrocarbon, petrochemical and mineral industries and 50 light manufacturing and support industries. Another 65 industrial projects are in various stages of planning and construction. Industrial sites occupy nearly two-thirds of the city’s 185 sq km and an expansion will allow administrators to release another 185 sq km. The city has already witnessed hectic activity with more to come. Just built is a 400,000 barrels per day refinery jointly owned by Saudi Aramco (62.5 per cent) and China’s Sinopec, which holds the remainder share. Tests runs are underway and commercial operations are likely to begin shortly. The refinery will export an overwhelming portion of its production to markets including Europe and Asia. By July of 2015, an expansion at the Yanbu refinery of Saudi Aramco Lubricating Oil Refining Company (Luberef) will be completed. Samsung Engineering has the EPC and commissioning contract to set up a hydrocracking unit of 23,000 barrels per day, an ISO-dewaxing complex and a hydrogen manufacturing sulphur recovery complex of capacity 95 tonnes per day, among other facilities such as substations and cooling towers. Annual capacity at Luberef will rise from 280,000 tonnes to 710,000 tonnes of base oil. 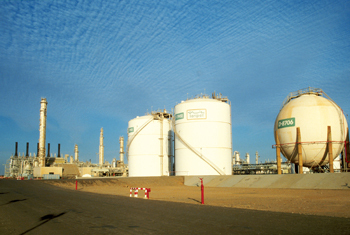 Saudi Aramco operates in Yanbu two other refineries, including one with Exxon Mobil (Samref), and a crude oil terminal. 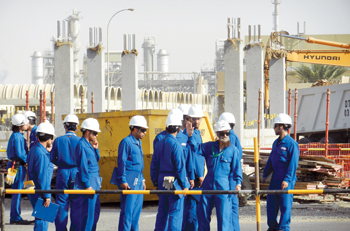 The petrochemical ventures in Yanbu include four Sabic affiliates – Yanbu, Yanpet, Yansab and Ibn Rushd (the Arab Industrial Fibres Company) – and a polypropylene plant operated by National Petrochemical Company (Natpet). A new plant for manufacturing polypropylene compounds, fruit of a joint venture between Natpet and US firm A Schulman, is nearing completion in the city. The joint venture will manufacture a line of customer-preferred engineered plastic compounds based on A Schulman’s highly regarded technology. Natpet, a well-established petrochemical producer in the region, will provide the joint venture with its regional infrastructure as well as its high-quality polypropylene resin. The joint venture’s new plant, having capacity of 100,000 tonnes per year in two phases, will enable A Schulman and Natpet to serve a broad range of customers in the Middle East, Africa and India and capitalise on a growing demand for durable goods and transportation products. All sales outside of these regions will be sold directly through A Schulman. A titanium sponge production facility will be set up in the city under a joint venture between Tasnee (the National Industrialisation Company), Cristal (National Titanium Dioxide) and Toho Titanium. Some of the raw material for the new plant will come from Cristal’s factory adjacent to the site of the proposed facility. An important project lined up for the future is the oil to chemicals plant that Sabic proposes to build in Yanbu. It expects to use around 10 million tonnes of crude oil annually as feedstock. The Royal Commission at Yanbu is also inviting investors to explore opportunities in light and support industries where hydrocarbon or mineral feedstocks will not be principal raw materials. These include advanced manufacturing in areas such as solar panel production, pumps, valves, motors, electrical components, paint production and metal casting. In earlier years, manufacturing in the light and support industries category was dominated by construction materials such as aggregates and concrete. However, in later years, the focus has moved to the production of goods that address industrial and community concerns including chemicals, steel fabrication and edible oils refining. Yanbu’s administrators are keen that while they raise the city’s industrial profile they also maintain high living standards for its residents and guests. Recently, a package of investment projects was unveiled during an investment forum and it included a tourism island, four hotels, an international specialist hospital, a holiday resort east of Yanbu port, a health resort and a housing city to accommodate 150,000 workers. Hilton, meanwhile, announced it will build a hotel in the mid-scale brand by early 2017. “As Hilton Worldwide expands in this vast and rapidly evolving country, we are delighted to have secured a prime site for Hilton Garden Inn in Yanbu,” said Rudi Jagersbacher, Middle East and Africa manager for the company.